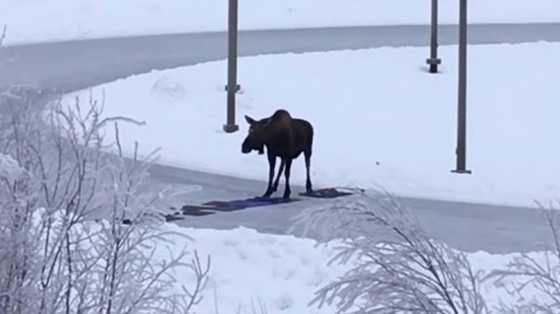 A moose that got stuck on an ice rink got a helping hand from some Good Samaritans who witnessed her troubles. 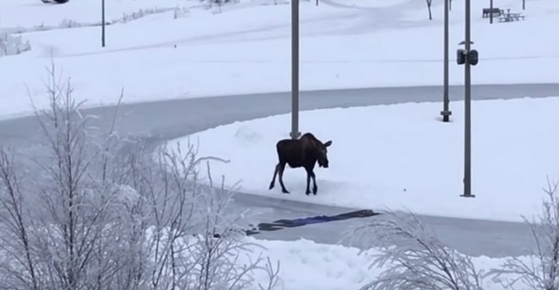 While on their lunch break, a group of people in Anchorage, Alaska noticed a moose traversing an outdoor skating rink. The moose had crossed over the rink into the center part of the field. The animal had trouble getting across, so when it came time to cross back over, she was struggling. She had attempted several times to cross but it was too slippery. After several hours, the Good Samaritans decided to see if they could help, and the solution they came up with was pretty ingenious. "Yoga mats seemed like an obvious choice for grip, but we scoured the building and our cars for anything that could be useful since it’s a fairly long stretch of ice. Responses to "Good samaritans see moose struggling on ice rink and come to the rescue"